(FinalCall.com) - Severe weather can strike at anytime and in recent days, a storm system of tornadoes pummeled several southern and Midwestern states. The storms left millions of dollars in damages and took lives in what has been described as one of the worst storm series in decades. These severe weather outbreaks also follow divine warnings from the leader of the Nation of Islam about God’s judgment against America in recent weeks. Forty-four people in six states were killed and 15 states suffered property damage in the three-day carnage caused by the tornados, news and weather reports indicated. Ninety-seven tornadoes struck 15 states over a week, according to federal officials. The wind and water assault began on April 14 in Oklahoma and were the deadliest since 2008, the reports added. 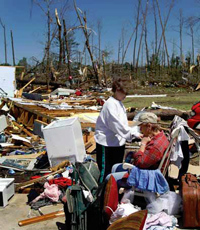 North Carolina, Alabama and Mississippi were hit hardest, according to the Federal Emergency Management Agency (FEMA). The agency had 12 teams in North Carolina, one team in Alabama and three teams in Mississippi as of April 18 to help assess damage and determine if additional federal support would be needed, the agency said. The storms subsided over the April 17 weekend but not before killing an estimated 22 people in North Carolina alone. “I was truly sad, almost to the point of being tearful at times to talk to the people,” Gov. Beverly Perdue said at a press conference in downtown Raleigh on April 16. She addressed reporters after she conducted a 6 1/2 hour tour of massively damaged areas in six counties the day before. Gov. Perdue said she was especially saddened to talk to survivors who like many that live on the coast, are used to the signals and are the least likely to pay attention. “They were so grateful to be alive,” she said. More than 130 homes were destroyed and 700 reported as damaged, Gov. Perdue’s office further indicated. Seven people were killed in Alabama, which was hit by more than 30 tornadoes, according to the National Weather Service. The agency reported that one of the tornadoes that killed three people in Autauga County had winds of 140 miles per hour. The three scientifi c factors contributing to the ravaging tornado outbreak were a powerful jet stream, moisture and a strong cold front, according to weather scientists. However, the Honorable Minister Louis Farrakhan has attributed the wrath to God’s anger with America over its mistreatment of Blacks in her midst. Blacks built the country, picked the cotton that made the South rich and fueled the Industrial Revolution in the North, he said, in a major address at the end of February and in several subsequent speeches and radio interviews. Blacks fought in all of America’s wars, yet America treats the children of her ex-slaves shamefully, refuses to let them go and give them a good send off, and plots their death, Min. Farrakhan has said. The “reason that judgment is on America is not because of bad policies and what she has done to other nations of the earth. But the reason that his (God’s) anger is kindled against America and his threat to destroy America is because of what America has done, is doing and plans to do against the Black man and woman of America whom I have declared to the world of religion … that we are the Children of Israel and we are the fulfi llment of God’s prophesy and promise,” said Min. Farrakhan during a March 31 press conference at Mosque Maryam in Chicago. The Minister called the press conference to warn of major disasters and a major earthquake coming to America. He also warned that the devastation seen in Japan was a sign of what would happen inside the United States. “Allah is fighting now to deliver us in the exact manner that he said he would through the mouth of the Honorable Elijah Muhammad. Remember his words. He said God is going to use four great judgments: rain, hail, snow, and earthquakes. The forces of nature are great weapons as we see them in play not only in America but throughout the world,” Min. Farrakhan said, in another major lecture. “What can you do against a God like that?” he asked rhetorically. The Minister raised the question and provided additional warnings during his Feb. 27 keynote address at the Nation of Islam’s annual Saviours’ Day 2011 convention in Rosemont, Ill. Min. Farrakhan reiterated the consistent warning initially issued by his teacher, leader, guide and spiritual father, the Honorable Elijah Muhammad. Min. Farrakhan particularly addressed how major snowstorms had rendered America defenseless against God by paralyzing her airplanes, tractors and other modes of transportation. Biblical scriptures say God stored snow in the North for use in this great day of battle, he said. The recent series of tornados have continued the pattern of severe weather throughout the U.S. that Min. Farrakhan has referenced. During his Saviours’ Day address, the Minister noted there was extreme record-setting weather in China, Russia, Pakistan, India, Australia, Mexico, South Korea and Taiwan. In addition to extreme temperatures, there were droughts, landslides, volcanoes, hurricanes heat waves typhoons, monsoons, torrential rains, blizzards and fl oods, Min. Farrakhan continued. More people were killed worldwide by natural disasters this year than have been killed in terrorism attacks in the last 40 years combined, Min. Farrakhan added. 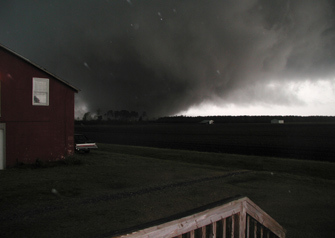 Around this time last year, a mile wide tornado struck Mississippi and killed 10 people. This time around, lives were spared but property damage was massive, David Muhammad told The Final Call. He is leader of the Muhammad Study Group in Jackson, Miss. and a math teacher at Forest Hill High School. There were some power outages but no casualties or injuries in their area as a result of the tornado that drove directly through Jackson, according to Mr. Jackson. “It was defi nitely a scare for a moment but all the believers are fine,” he said. Mr. Muhammad recounted that the disaster struck during the workday making it very nerve wrecking. The school conducted its normal tornado drills but since drills are so routine, students did not take them seriously until lights actually went out, he continued. “We could hear it whistling like a train and it would pull trees and other things right out of the ground, into the air. Cars were 12-15 feet into the air. It came right across the highway and some people were trying to drive away from it. “Maybe they just got caught into it but it literally took about 30 minutes at the most to pass across the entire city. You can’t describe the destruction,” Mr. Muhammad said. Weather experts have indicated that this storm series was the deadliest since Feb. 5, 2008, when 57 died in the “Super Tuesday” Election Day tornadoes in the Southeast, which was the highest tornado death toll since 76 fatalities in 1985. “A major storm system like this is going to happen every few years, usually in April or May,” said Greg Carbin of the federal Storm Prediction Center in Norman, Okla. While May is the nation’s busiest month for twisters, they surge sharply in April, and most early spring tornadoes strike the Southeast and South Central states. Indeed, the biggest tornado outbreak on record occurred April 3-4, 1974 when 147 confi rmed twisters touched down in 13 states, claiming 310 lives in the United States and 8 in Canada. For about the past 30 years, the United States has averaged 135 tornadoes in April, the highest number being 266 in 1974, according to Jake Crouch of the National Climatic Data Center in Asheville, N.C. In these latest storms, the National Weather Service is investigating 267 preliminary tornado reports. But many of those will turn out to be duplicates, predicted Mr. Corbin.